Casa Di Amore has a nice, big parking that is handicap accessible. We also have plenty of street parking as well. We are about 10 minutes by car from the Las Vegas strip. There are Public Transit stops going East and West right nearby. Chef Juan P. Ortega, 25 years of Italian exp. Live jazz and standards performed nightly put the special touch on your dining experience at Casa Di Amore. Casa Di Amore is Vegas, the way it used to be! Your dining experience is sure to be delightful. Wonderful old school atmosphere with traditional Italian fare, live entertainment nightly and friendly, knowledgeable service. 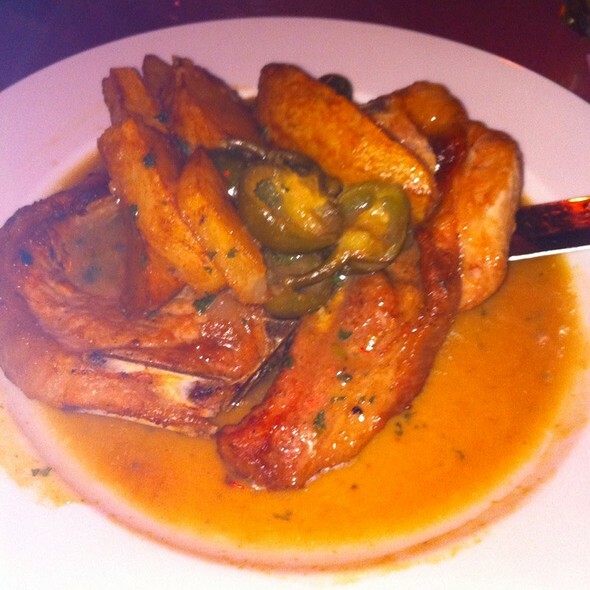 Menu selections include Osso Bucco, Cioppino, Steak Sinatra, and Pork Chops with Vinegar and Peppers. Everything is house made with attention to quality and taste. Great wine selection and full bar, plus a hip, yet old school comfy lounge. Slowly roasted mini veal shank topped with chef's demi-glaze, served over a bed of risotto. Lightly floured squid fried golden brown. Served with a side of marinara sauce. Fresh mozzarella, ravioli, shrimp and calamari all fried to a golden brown. Served with a side of marinara sauce. Jumbo shrimp wrapped with prosciutto and stuffed with cheese, then wrapped again in filo dough and baked to perfection. Accompanied by the chef's special walnut caramel sauce. A mix of rissoto and fresh mozzarella rolled in seasoned breadcrumb and pan fried to a golden brown. Served with a side of marinara sauce. Fresh clams stuffed with bread crumbs, garlic parmigiano-reggiano, oregano and fresh parsley. Slices of our homemade italian bread toasted and then covered with a mix of diced roma tomatoes, onions, fresh basil, black olives, and buffalo mozzarella topped with extra virgin olive oil. Fresh mushrooms sauteed in olive oil and fresh garlic tossed with italian seasoned breadcrumbs and parmigiano-reggiano. Slices of our homemade italian bread toasted, then toppedwith fresh buffalo mozzarella and thin slices of prosciutto. 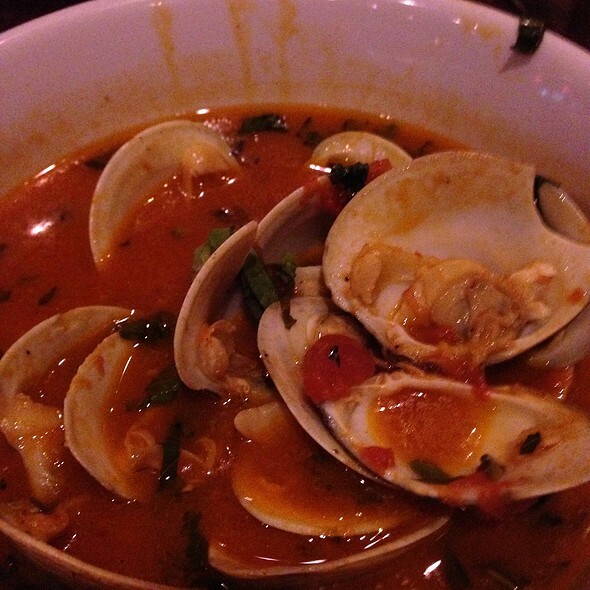 Fresh clams steamed in your choice of a white wine or a marinara sauce. Served with a piece of garlic bread. Fresh mozzarella and sliced roma tomatoes topped with fresh basil, olive oil and italian seasoning. Roasted red peppers and artichoke hearts surrounded by an array of select meats and cheeses. Bell pepper stuffed with a mix of rice, ground beef and parmigiano-reggiano, butterflied and topped with melted provolone cheese and our homemade marinara sauce. Ravioli stuffed with pieces of tender lobster and topped with a pink cream sauce. Our fresh greens sauteed with olive oil and garlic topped with a touch of parmigiano-reggiano. Mussels simmered in a marinara sauce with a touch of white wine. Served with a piece of garlic bread. Jumbo shrimp sauteed in butter, garlic, lemon and olive oil. Our homemade italian bread stuffed with fresh garlic, italian seasonings and cheeses, baked to bubbly perfection. Mixed greens tossed with fresh buffalo mozzarella and tomatoes in a balsamic vinaigrette. A healthy bed of romaine topped with salami provolone, ham, roasted red peppers, artichoke hearts and fontinella cheese. Fresh spinach tossed with walnuts, bacon and balsamic vinegar. Our caesar salad topped with your choice of grilled chicken or shrimp. With vegetables and pastina noodles or ask your server for the soup of the day. Add your choice of a cup of our homemade soup or a house or caesar salad for $3.00. A boneless chicken breast sauteed with mushrooms, fresh garlic and white wine. Served in a lemon butter sauce with a side of pasta. A boneless chicken breast sauteed francaise style with mushrooms, artichoke hearts, and olives. Served with a side of pasta. A breaded chicken cutlet topped with tomato sauce and baked with mozzarella cheese. Served with a side of pasta. A boneless chicken breast sauteed in a mushroom marsala sauce. Served with a side of pasta. A boneless chicken breast sauteed with butter, lemon, fresh mushrooms, white wine and capers. Served with a side of pasta. A boneless chicken breast sauteed in lemon butter sauce. Served with sliced roma tomatoes, buffalo mozzarella and fresh basil. Served with a twice baked potato and fresh vegetables. A boneless chicken breast sauteed with creamy spinach, then covered with provolone cheese and baked to perfection. Served with a twice baked potato and a side of vegetables. Add your choice of a cup of our homemade soup or a house or caesar salad for $3.00. All steak dishes come with your choice of a 12 oz. New york strip or a 16 oz. Bone in ribeye. The steak of your choice grilled to perfection. Served with a twice baked potato and fresh vegetables. The steak of your choice grilled with lemon, garlic, olive oil and italian seasonings. Served with a twice baked potato and fresh vegetables. The steak of your choice marinated and grilled. Topped with portobello mushrooms and roasted peppers in a balsamic vinegar / red wine demi-glaze. Served with a twice baked potato and fresh vegetables. The steak of your choice, pepper crusted and pan-seared to your temperature of choice. Topped off with a light brandy demi-glaze cream sauce. Served with twice baked potato and fresh vegetables. Tender pieces of veal sauteed with mushrooms, fresh garlic and white wine. Served in a lemon butter sauce, with a side of pasta. Tender pieces of veal, pounded thin and sauteed in a mushroom marsala sauce. Served with a side of pasta. Tender pieces of veal pounded thin and sauteed with butter, lemon, fresh mushrooms, white wine and capers. Served with a side of pasta. A breaded veal cutlet topped with tomato sauce and baked with mozzarella cheese. Served with a side of pasta. This dish features two 8 oz. Pork chops which are breaded and baked to perfection. Served with a twice baked potato and fresh vegetables. A favorite among many of our regular customers. This dish features two 8 oz. Pork chops sauteed with olive oil, italian seasonings, then topped with cherry peppers in a tangy vinaigrette sauce. Served with a side of wedged potatoes. Two 8 oz. Pork chops stuffed with prosciutto and provolone cheese topped with a brandy cream sauce. Served with a twice baked potato and fresh vegetables. An absolute house favorite. This dish is packed with generous portions of fresh seafood including lobster, clams, mussels, scallops, crab, cod and shrimp. Fresh shrimp, mussels, clams, scallops and calamari in your choice of red or white sauce traditionally served over linguini. This is a fabulous dish featuring fresh clams, both chopped and whole in your choice of either a red or white sauce over linguini. Shrimp simmered in a spicy marinara sauce served over linguini. Grilled filet of salmon in a lemon, garlic and olive oil sauce. Served with a twice baked potato and side of vegetables. Jumbo shrimp sauteed in butter, garlic, lemon and olive oil served over a bed of linguini. Pan roasted salmon topped with fresh tomatoes and capers in a white wine and lemon sauce. Served with a twice baked potato and side of vegetables. Pan seared golden brown scallops with melted provolone cheese, topped off with a four cheese mushroom sauce. Accompanied by fresh vegetables and twice baked potato. Grilled scallops tossed in a lemon, garlic and olive oil sauce. Accompanied by fresh vegetables and twice baked potato. Add your choice of a cup of our homemade soup or a house or caesar salad for $3.00. Add a side of meatballs or sausage to your dinner $4. Homemade potato dumplings served with your choice of meat sauce or marinara. Fresh homemade egg noodles tossed with a combination of crumbled and sliced smoked sausage, mixed with sauteed sweet onions in a white wine four cheese sauce. Our homemade gnocchis with prosciutto, white wine and spinach in a four cheese sauce. Penne pasta tossed with chicken, shrimp, broccoli and mushrooms in a light pink sauce baked in the oven with fresh mozzarella. Fresh eggplant coated with italian seasoned bread crumbs, baked with parmigiano-reggiano and mozzarella cheese and covered with a tomato basil sauce. Served with a side of pasta. Filled with fresh ricotta cheese, ground beef, italian seasonings, and melted mozzarella. This classic dish is served with your choice of meat sauce or marinara. Very comparable to baked ziti. This dish offers penne pasta mixed together with fresh ricotta cheese, parmigiano-reggiano and mozzarella cheese baked until golden brown. Served with your choice of meat sauce or marinara. 3 super jumbo homemade cheese ravioli with your choice of marinara, meat sauce or pesto. 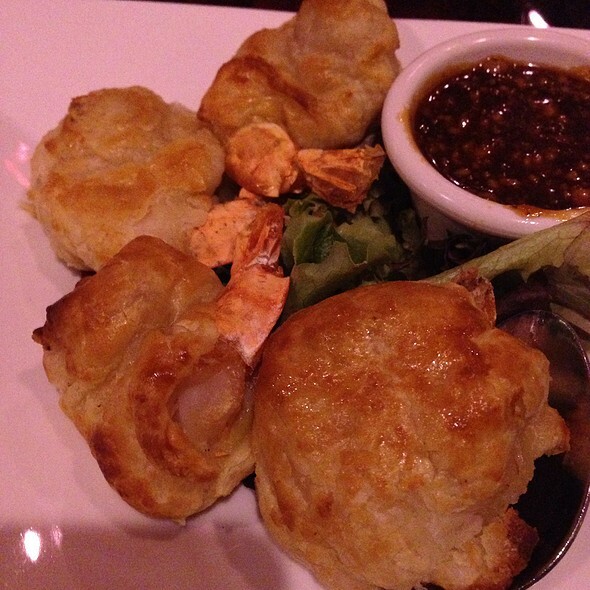 One of our most popular dishes. Fresh homemade noodles served with a sauce of butter, cream, and parmigiano-reggiano cheese. Our tubular pasta stuffed with ground veal, spinach, mozzarella and Parmigiano-Reggiano cheeses, topped with a Bechamel sauce. An entire pound of pasta, served in a nice big bowl. 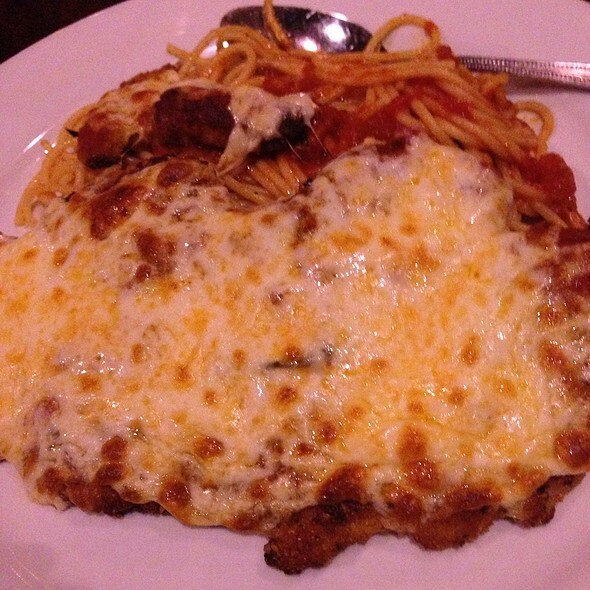 A classic favorite, served with your choice of meat sauce or marinara, plus your choice of meatballs or sausage. Our penne pasta in a distinctive tomato sauce accented with vodka and made velvety with heavy cream. A generous portion of escarole sauteed in olive oil and fresh garlic, served with penne pasta. A large portion of broccoli prepared in fresh garlic and olive oil, mixed into rigatoni pasta. A very light and refreshing dish. Our classic linguine pasta with our world famous gypsy sauce, which is a wonderful garlicky, spicy marinara. Add fried shrimp to make it just right, boss! Penne pasta tossed in a pesto sauce made from garlic, pine nuts, and fresh basil mixed parmigiano-reggiano and heavy cream. Linguine pasta mixed with a generous portion of sauteed calamari in a lightly spiced marinara sauce. A generous portion of cappelini pasta tossed with the perfect amount of garlic and olive, mingled with fresh basil and tomatoes. Our corn based penne pasta cooked to order with your choice of meat sauce or marinara. Try it with our meatless meatballs! An authentic sicilian favorite. Crisp pastry shells stuffed to order with our sweet, cannoli cream filling mixed with chocolate chips, dusted with powdered sugar and served over a drizzle of our chocolate sauce. Rich baked vanilla custard with a browned vanilla sugar top and served with berries. Mascarpone cream on a sponge base covered by a row of espresso drenched ladyfingers topped with waves of mascarpone and dusted with cocoa powder. Mango, passion fruit and raspberry sorbetto all covered in white chocolate and drizzled with chocolate. Traditional new york cheesecake flavored with a hint of vanilla. Strawberry, pistachio and chocolate gelato all coated with chocolate. Moist chocolate cake with a heart of creamy rich chocolate. Like old Vegas. A gem off the strip. Love it. Casa di Amore never disappoints. Service is always great. Tonight we had Claudia and she was excellent. Took great care of us. Food was also excellent. Highly recommend for a wonderful evening of good food, ambiance and entertainment. Difficult for me to be objective since I don't like "old school" or Italian food. Yet, 4.5 stars from me! Restaurant was packed when we arrived. Packed when we left. Be prepared to wait even with a reservation. Also (we were there to celebrate a birthday), be prepared to hear "Happy Birthday" sung a dozen times throughout dinner. Popular, iconic, Italian, Vegas restaurant. I found the noise level "loud." (Not a place to go on a first, romantic date.) Nonetheless, regardless of the noise, the waitress never missed a beat. Solid 4.725 rating for those who like this kind of food/place. Had a great time and a great authentic Italian meal. The atmosphere was definitely old Vegas. Our server, Tony, was very good and had a funny personality. Would certainly eat there again. The food is always excellent. The service was good, and the lounge music is always enjoyable. Increasing the number of handicap accessible parking spots would make the restaurant nearly perfect. Was a little nervous about the locale, but once we walked in the door I was happy. We were graciously accommodated in our request for a different table and our waiter promptly came over to get us started. He answered all questions patiently and with a smile! The restaurant has complimentary pick-up/drop-off, which we appreciated very much! There was live music which really added to the ambiance. The food was very good and the bread was freshly baked. Will definitely come back next time I come to Vegas! Great atmosphere, great food, and the music was great! We enjoyed our dinner - our best meal while visiting Las Vegas! The service was excellent, and so was the food! 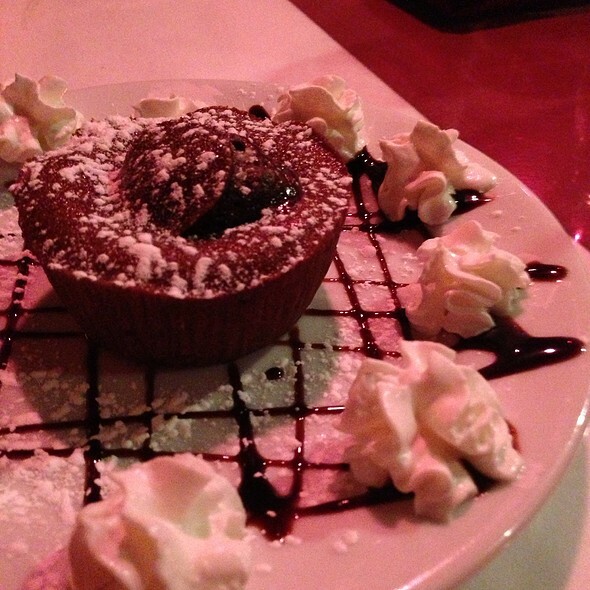 Gnocchi, shrimp diavolo, ravioli and lasagna were all delicious; we also enjoyed the canoli and chocolate cake! Great cozy atmosphere, music and fun..
Just like the old days ..great friendly service!! Highly recommend!! Go there once...you’ll be there twice!! Josh was our waiter and just perfect...nothing was left undone...really great server. The food was terrific as always and we enjoyed the desserts were also delicious. The atmosphere is great....reminiscent of old Vegas. We always enjoy the entertainment. Absolutely loved Casa di Amore! We gathered there with family and everyone enjoyed the atmosphere, food and entertainment. Can't wait to go back! Always great food a hidden gem in Las Vegas. I go here often never disappoint me. It is noisy in there and the ambience is good, nightly live music. Lovely little hidden treasure in Vegas. The food was fabulous! Our waitress was wonderful! And the music was Phenomenal!! This little spot will always be on our must eats every time we come to town!! Thank you for such a fun evening! Great home style classic Itilian food. This place has been here since I can remember. You can’t go wrong with anything on the menu. My go to place for my Itilian food fix. Bomb went off! LOL! Great atmosphere with wonderful live, interactive music. I will definitely visit again! Already have referred friend visiting Vegas this restaurant. Everything from the place to the people, including the driver who picked us up were great. Wish they were in my hometown cause it would be a frequent place of visit. Thank you . 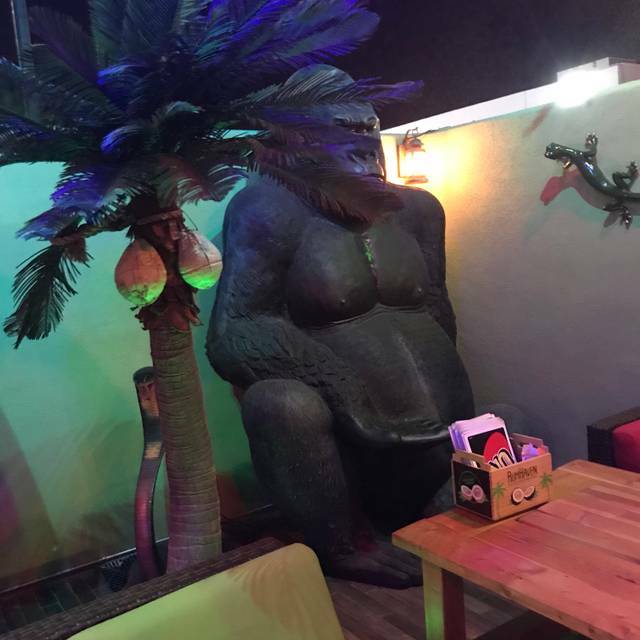 Great time, great fun, great food and an added treat with tiki bar and specials in the back! Always great to sit outside and have a drink! 1/2 off specials on drinks and pizza!!! I had to change the reservation for a party of 5 to 2 very accommodating . Service was great. The musicians Jim & Paul very nice. Had a wonderful dinner again at Casa di Amore. We asked for our favorite waiter Kyle and he remember us. We stopped at this restaurant before heading to the Smith's Center. Not only is the food fabulous we had a good time and still make the show on time. The staff is very friendly and the chef made us something upon request. Who says all the great restaurants are on the strip. Fantastic local restaurant. I highly recommend it. Always one of our first stops when we come to Vegas. The food, wine, service and atmosphere is always amazing. They’ve always had live music when we’ve been there and this time we evern utalized their pick up service, Henry was so friendly and we can’t wait to go back! It was awesome. They even had a free shuttle running to take us back to the strip after an awesome dinner. Great place to eat off the strip. Have been multiple times and every experience has been great! We truly enjoyed our dinner here. The music was terrific - a Sinatra vocalist at the piano - and the service and food were excellent, too. This is a real-deal old school Vegas Italian restaurant! Well worth the ride from the Strip! Great food, great live music, great experience. I will be coming back very soon. Food tasted authentic and made with love. Soooo delicious. Wine selection was wonderful. I enjoyed everything about my experience. 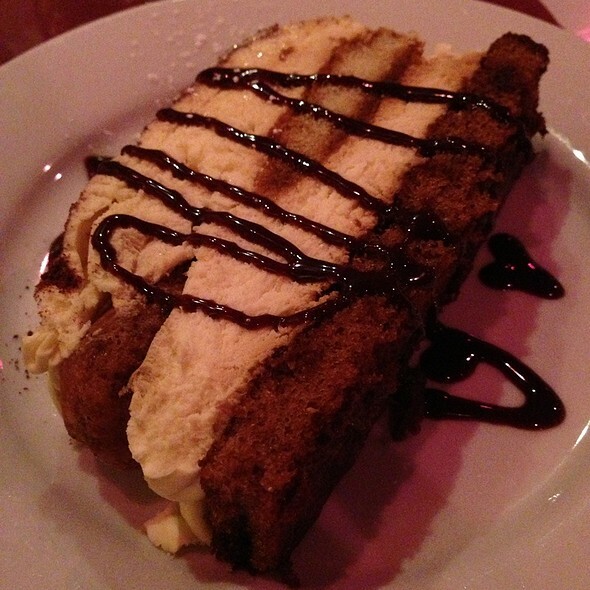 If you haven’t been to Casa Di Amore you are missing out! We have been to the outdoor, Tiki Bar area and loved it! Half price pizzas and drinks on the patio every night... amazing pizza! Don’t forget to order the Gypsy Sauce with your pizza. The dining room is vintage, Las Vegas class! We loved the ambiance with the live music, it looked like everyone there was having a great time. The service was fantastic, very attentive and professional! The food... unbelievable! 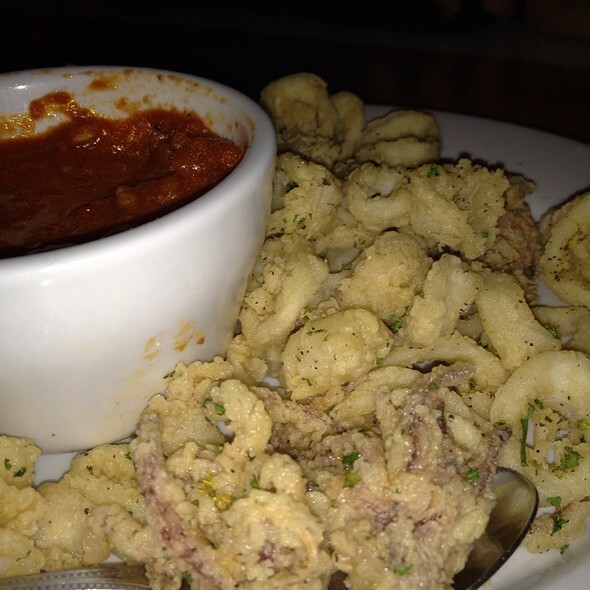 Order the calamari if that is something you like, it’s seriously amazing! We ordered the eggplant Parmesan and split it with my girlfriend. The portions are very generous and extremely tasty! I highly recommend Casa Di Amore, we can’t wait to go back! Waited over 30 min for a table though we had a reservation. Place was crowded and loud so a quiet, catch-up with friends would be difficult. Food was good but not outstanding. Bolognese sauce was bland. Veal was tender. Service staff was good. Fantastic little gem! Old VEGAS at its finest ! And the food was fabulous. Come with an empty stomach. 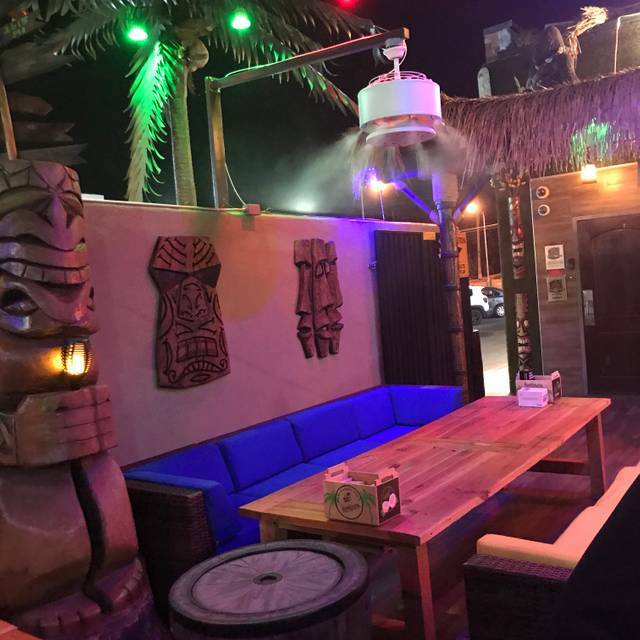 The addition of the tiki bar patio outside was the cherry on the top after dinner.